Does your data center give you a strategic business advantage? If you had to hesitate, or you answered “no” to this question, there are industry leaders Equinix thinks you should meet. 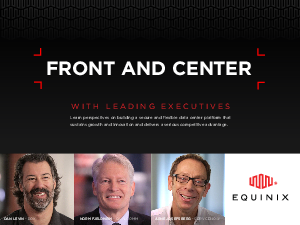 Equinix interviewed prominent C-level executives to gain their perspectives on the evolving role of the data center in the enterprise. This paper illustrates different perspectives on building a secure and flexible data center platform that sustains growth, innovation and delivers a serious competitive advantage. Download now to discover how to transform your data centers into strategic assets.